Construction workers can now buy hard hats and safety goggles from on-site vending machines. Contractor Barr Construction has been trialing the scheme to make sure all of its subcontractors are kitted-out in the correct personal protective equipment (PPE). Workers who turn up to the job without the proper safety clothing will now have immediate access to everything they need thanks to the dedicated machines from specialist Vendease. Martin Oldfield, health & safety manager for Barr Construction said: “Health and safety is Barr Construction’s number one priority. “As an employer which takes the safety of its personnel extremely seriously, Barr provides PPE to its workforce free of charge as a matter of course. “On sites where subcontractors make up part of our team, the onus is on these companies to provide their own staff with suitable PPE. “In the past, there have been rare occurrences where subcontractor operatives have arrived on site with incomplete PPE or have needed to replace substandard safety equipment. 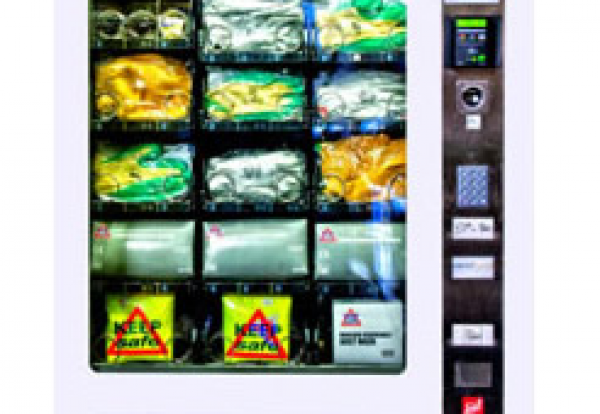 “The PPE vending machine has been provided as part of a trial to cater for these few instances and thus remove the need to leave site to collect replacement kit. Dave Berman, Director of VendEase, said: “Thanks to vending machine technology, Barr now has a cost neutral solution to the often expensive obligation of providing essential safety gear.